Sony’s new Xperia Z2 is finally in the market and it is a flagship from every angle. Lumia 1520, another addition in the Nokia Lumia series is a big phone/phablet. Phablets are becoming increasingly popular and a big sturdy Nokia phablet sounds quite desirable. Nokia Lumia 1520 is the biggest phone yet from Nokia and it has some very impressive features and Nokia’s legendary reliability and sturdiness. But how does it do against the stylish Sony Xperia Z2? Let’s have a detailed look on different specs of these similar yet quite different smartphones and compare them. Below you will get detail Comparison Review of Nokia Lumia 1520 vs. Sony Xperia Z2 Smartphone Specifications, Features, Price and Availability. Sony Xperia Z2 has a 5.2 inch screen with a full HD 1080p display. Sony has included IPS LCD with Triluminos technology coupled with Live Color LED in their flagship phone. It provides Xperia Z2 with sharp and bright images with very true color representation. The pixel density of 424 PPI is very impressive. Nokia Lumia 1520 also uses the IPS LCD technology and has a massive 6 inch screen with the same 1080p resolution. Bigger screen with same resolution means Lumia 1520 has a lower pixel density of 367 ppi. Display in both the handsets are quite magnificent with Xperia Z2 having a slightly upper hand with higher pixel density and triluminous technology. 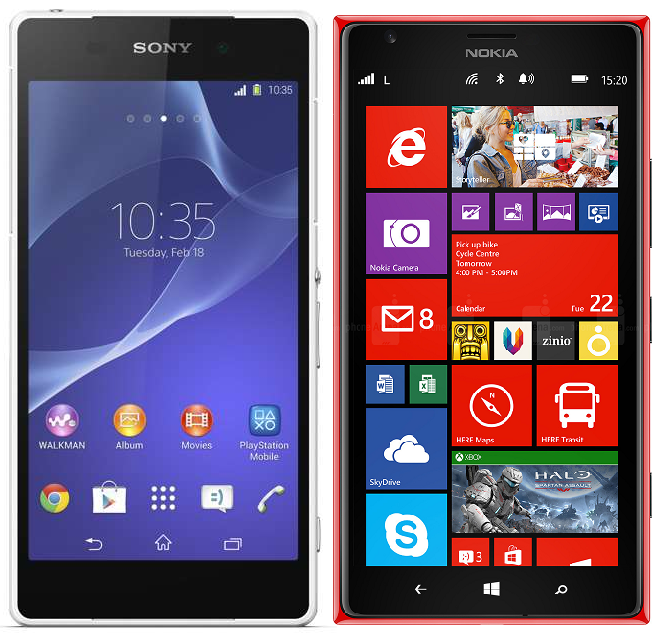 The Sony Xperia Z2 and the Nokia Lumia 1520 are quite dissimilar in terms of design. The Xperia Z2, with its aluminum and glass body, looks very classy and stylish. Lumia 1520 also has a very stylish but kind of funky tapered design and comes in various colors which provide the customers with a huge choice. Many people would find both these handsets hard to handle because of their huge size, but the Xperia Z2 is fairly smaller and much easier to carry. The Xperia Z2 is 46g lighter and has a completely waterproof and dustproof design. Both these smartphones have powerful rear cameras with quite interesting features. The Sony Xperia Z2 has a 20.7 rear mega-pixel camera. It’s also powered by LED flash, auto focus feature with 1/2.3” sensor, while Nokia Lumia 1520 is powered by 20 mega-pixel Carl Zeiss camera and aperture of f2.4 with 1/2.5” sensor. It’s also powered by optical image stabilization and LED flash. In the video recording, Xperia Z2 has an upper hand with the feature of video capture in 4K resolution, Lumia 1520 captures video in 1080p resolution. The Front camera in Xperia Z2 is 2.2 MP while Lumia 1520 has a 1.2 MP front camera. The Sony Xperia Z2 is equipped with 2.3 GHz quad core krait 400 processor. Nokia Lumia 1520 is almost neck and neck with 2.2 GHz quad core krait 400 processor. The brand new Qualcomm Snapdragon 801 chipset present in Xperia Z2 is also more efficient and faster than the Qualcomm Snapdragon 800 chipset present in Lumia 1520. Moreover, Xperia Z2 is also ahead in the memory department with 50% more space in the RAM (3GB) compared to 2 GB of Nokia Lumia 1520. Sony Xperia Z2 has 16 GB of internal memory, which is half of the internal memory you get in the Lumia 1520. However both the handsets support micro SD external memory. In the Xperia Z2, Sony has refined the latest version of Android 4.4.2 Kitkat to provide the users with a simple yet attractive interface with some new exciting features. Overall Xperia Z2’s interface is quite similar to the Xperia Z1, with the same neat icons and visuals. The Lumia 1520 has a Windows 8 Black OS. It provides the customers with usual tiled and animated interface of Windows. Although windows is developing rapidly and 8.1 update is on its way, but the Android’s ecosystem is arguably the best in the world with much more apps and customization options. The Xperia Z2 has a non-removable Li-Ion 3200 mAh battery, which provides a standby of up to 740 hours and talk time of up to 19 hours on 3G. On the other hand, the Lumia 1520 has a slightly more powerful Li-Ion 3400 mAh battery, which provides 25 hours of talk time on 3G and 768 hours of standby. Both the handsets have some pretty impressive features which make them two of the most expensive smartphones. The price varies for different markets and Nokia Lumia 1520’s price is approx. $700 USD Dollars, while Sony Xperia Z2 is approx. $800 USD Dollars. Xperia Z2 can be considered a superior phone with its powerful Snapdragon 801 chip giving it an edge over the Nokia Lumia 1520. On the other hand, the Nokia Lumia 1520 has a bigger screen and very powerful camera. Both the smartphones have stylish and attractive design features. With both phones in the same price range, it totally depends on the preferences of the customer which phone they like more. Many windows fans would definitely prefer Lumia 1520 over Xperia Z2 while the others would go for the Android powered Xperia Z2.